July 1, 2011 / pcwainwr / Comments Off on An optical illusion? Zooplanktivory is one of the most distinct feeding niches in coral reef fish and many morphological traits have been interpreted as adaptations to feeding on plankton in the water column above the reef. One of these traditional hypotheses is that zooplanktivorous fish have larger eyes for sharper visual acuity. A larger eye usually has a longer focal length and thus is expected to produce a better-resolved image. Schmitz, L. & P.C. Wainwright (2011). Ecomorphology of the eyes and skull in zooplanktivorous labrid fishes. Coral Reefs, 30: 415-428. reprint. Labrids are a species-rich clade of reef fish with enormous morphological and ecological diversity. 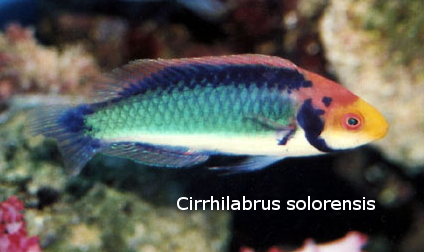 We sampled a total of 21 species, with three independent origins of zooplanktivory: Clepticus parrae, the Creole Wrasse (photo: fishbase.org), Halichoeres pictus, the Rainbow Wrasse (photo: wetwebmedia.com), and Cirrhilabrus solorensis, the Red-eyed Fairy Wrasse (photo: fishbase.org). To our surprise we failed to find any indication of larger eyes in zooplanktivores. We tried several methods, including phylogenetic residuals of eye diameter on body mass and evolutionary changes in eye size along branches leading to zooplanktivores, but zooplanktivorous labrids did not show any signs of having larger eyes than other trophic specialists. Instead, we suspect that the notion of large eyes in zooplanktivorous labrids is an optical illusion evoked by a size reduction of the anterior facial region, which makes the eye look bigger. However, we did find other features interpreted as adaptations to zooplanktivory in labrids. 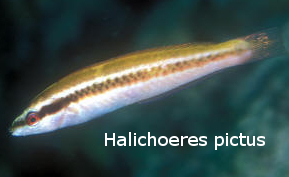 Both Clepticus parrae and Halichoeres pictus have a large lens for given axial length of the eye, related to better visual acuity, a round pupil, possibly an adaptation to search a three-dimensional body of water for food, and longer gill rakers to help retain captured prey. Our results are quite interesting in that they highlight the importance of many-to-one-mapping in form-function relations. There often is more than one possible pathway to perform a function. In labrids, increase in eye size to improve visual acuity apparently is not part of the evolutionary response. But, let’s see what we can find in other groups!